On May 24, I was marching northbound on the Appalachian Trail, not suspecting I was about to be offered a great job at Joshua Tree National Park. As soon as I got the news, I knew I would be unable to complete my planned thru-hike. Much as I wanted to stay on the trail, this opportunity was too good to pass up. So, instead of walking all the way from Georgia to Maine in a single season, I figured I would continue hiking until the summer solstice. The remaining month of walking would get me to Harpers Ferry, West Virginia, just shy of the midpoint of the 2,185 mile Appalachian Trail. Harpers Ferry felt like a good, ceremonious ending place, and I liked the idea of doing half the AT, even if I couldn’t do the whole thing. A week of continued hiking, though, changed my mind. Instead of being fully present on the trail, in the total immersion in nature that I had enjoyed so far, I found my thoughts drifting ahead and growing chaotic. I needed to find a place to live. I needed to figure out the logistics of moving my stuff from storage in a couple of different locations around the country. I realized that, for the first time in my NPS career, I’d be in a non-uniformed position, so I would need some new clothes. I’ll have to think about what to wear in the morning instead of just pulling on a clean gray shirt and green pants. I needed to change my car insurance and registration and get a new drivers license and update my address with High Country News and the Atlantic and were there any other magazine subscriptions I had on hold? How much was all this going to cost? My busy brain abandoned the beautiful simplicity of trail life before my body did. After a week of that strange dichotomy, I decided the time had come for me to move on to the next thing. I abandoned my hike without fanfare, returning to New Jersey (where I’d left my car) by hitchhiking and taking a series of buses. After spending some time with family, I loaded up the car and headed across the country, taking my time on the drive and visiting friends and some new-to-me national parks. I stopped at Cuyahoga Valley National Park in Ohio, Mammoth Cave National Park in Kentucky, Hot Springs National Park in Arkansas, Chickasaw National Recreation Area in Oklahoma, and Petrified Forest National Park and Walnut Canyon National Monument in Arizona. And now I’ve been in California for just over a week. I spent seven nights with friends while I scouted the area and looked for a place to live. I took care of some hiring paperwork and started explorations of my new park and the surrounding towns. I started feeling restless, though, after a solid week of nights spent indoors. Last night, I fled the air-conditioned comfort of guest bedrooms provided by kind friends, and camped at Indian Cove. It was this one night spent sleeping in my tiny, one-person backpacking tent that helped me most in reacquainting myself with the desert. I fell asleep with my tent door unzipped so I could gaze upward at the brilliance of the stars. 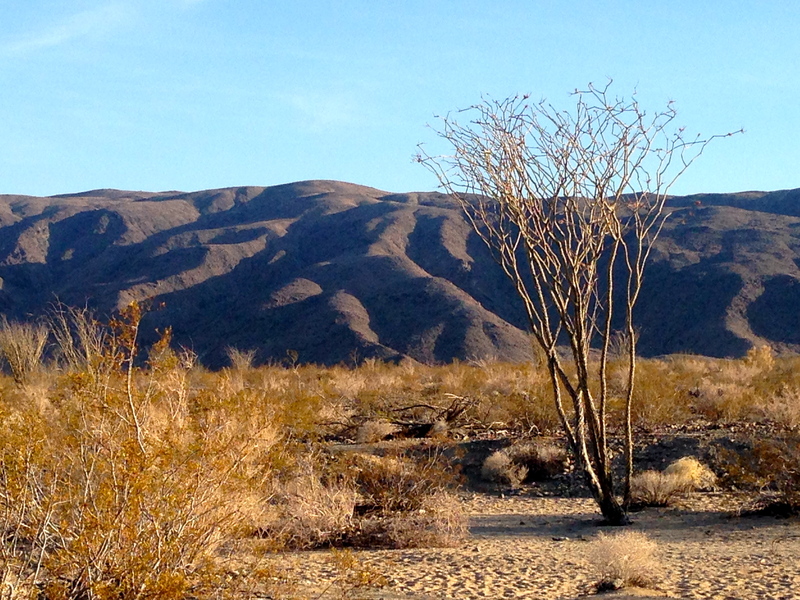 I woke to the scent of creosote bush in the dry, dry air and the hum of insects beginning their daily rounds. With 101 sites, Indian Cove is a big campground, but most of it is closed off at this time of year. Few people visit Joshua Tree in the summer months, when highs can top 100 degrees and overnight lows rarely dip below 70. I think there may have been two other campsites occupied last night, but I had no near neighbors. The solitude was just what I needed. I feel more at home—more integrated into this new place, this stark new landscape—after a single night camping than a week spent indoors and driving around the area. A sense of belonging is, for me, intertwined with immersion in the natural landscape. I am making a pledge to help myself stay grounded by camping at least two nights a month. An ocotillo reaches skyward in the Pinto Basin area of Joshua Tree National Park. It’s so hard when you can’t enjoy the moment because there’s so much else to think about. I struggle with the same thing when I do yoga. Your pictures are stunning though—is this Joshua Tree national park? I wish you success in your change. Thanks for reading, Becky, and thanks for the good wishes. Yes, I’ve just moved to Joshua Tree National Park, where I’ll be starting a new job in July. I’m excited about this new adventure, and am feeling less distracted now that I’m working on the many things I’d like to get done before I can start work. I would like to start doing yoga again myself–it’s been ages, and it’s a great way to practice getting that simple focus back again. Hope you’ve continued to camp twice a month and that you’re experiencing a sense of belonging in your new home. Thank you! I didn’t manage to camp at all in July, but that’s okay–I was moving and starting a new job and generally dealing with adjusting to a new life. I feel great about my decision to relocate and have had some fun outdoor explorations. Camping plans are in the works! Cathy, will you even see this? Somehow I stumbled upon your blog, and before I saw a photo, I knew it was you. Tortoise, right? Trillium, here. We last saw each other in Damascus, VA when you learned you’d gotten the new job and had decided to leave the AT. I was SO EXCITED for you, and hope it’s been, so far, everything you’d hoped… and, of course, worth leaving your thru. I’ve been browsing your blog, and love your writing and perspective. I am sorry we didn’t get to spend more time together… I think we’d have had so much fun together ID-ing the trees, plants, birds, etc. Email me… I’d love to hear how you’re doing. Aaaaahh! Trillium! Hi! I’m so excited to hear from you (even if it is months after you sent this comment). Hope you’re doing well and let’s get in touch!